The scientists' interest with the soft-bodied robot writhing in recent years. The soft body more makes robot more flexible in order to be in confined spaces or when dealing with finer objects safely. 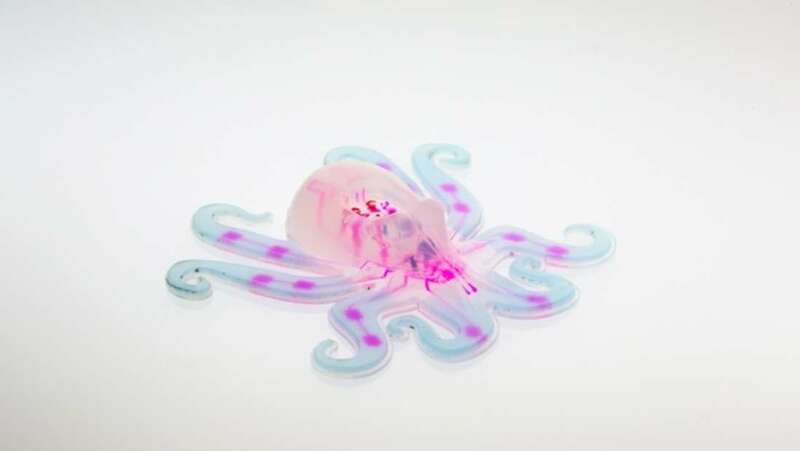 The octopus-shaped robot is a perfect blueprint for the kind of soft-bodied robots. A team of scientists from Harvard University to bring this cephalopod design into the future. They succeeded in creating of the 'Octobot', the world's first soft-bodied robot. Octobot has a height of less than 2 cm (0.8 inches) approximately the size of the palm of a human. The robot can walk for between four and eight minutes before running out of fuel. THe Octobot can run up to 8 minutes with 1 milliliter of fuel. 50 percent of their fuel is hydrogen peroxide solution. The larger versions can remain active for a longer time according to the amount of fuel. The Octobot made of silicone rubber. Its brain was a flexible microfluidic circuit that directs the flow of liquid fuel through the channel using the valve. "Just the brain, electronics, and batteries of component parts are hard," said Daniela Rus a robot expert at the Massachusetts Institute of Technology, Cambridge. "This work is new and really interesting."